Video editors are focused on video, and yet we all realize the importance of audio in setting the emotional tone of a production. But what's the best way to work with audio within a video production environment? You can capture, edit, and enhance audio clips within video editing tools like Adobe Premiere Pro, but these really are designed for assembling, mixing, and enhancing a production across multiple tracks, and really are not focused on preparing the individual clips. To address this need, Adobe acquired the Cool Edit Pro audio editor from Syntrillium Software in May 2003, and soon integrated it into the Adobe Video Collection suite, renamed as Adobe Audition. But as Audition has evolved and grown as a powerful tool for audio editors, it has expanded beyond the basic needs of video editors to just clean and enhance audio clips. So Adobe has taken the next step and developed a new product, Adobe Soundbooth, building the key features of Audition into a more focused tool for the needs of creative professionals. Soundbooth is all about quick and efficient preparation of audio tracks -- recording, editing, cleaning -- but without the need for training in sound production. Adobe will then include Soundbooth -- for Windows and also Intel-based Macintosh -- in the new Adobe Production Studio bundle, due to be officially announced as part of the new Adobe Creative Suite 3 on March 27, 2007. Meanwhile, Audition will live on, as Adobe plans to continue to develop it as a standalone product for audio professionals working in markets such as broadcast radio. Even more interestingly, Adobe has started releasing preliminary versions of some of its products as public betas through its Adobe Labs website -- including Soundbooth for Windows and Mac, and the new Adobe Photoshop CS3 for the Macintosh. So let's take a look at the new Adobe Soundbooth, as a sneak preview of Adobe's big announcement later this month. Think of Adobe Soundbooth as a focused but powerful waveform editor, for audio recording, basic editing, cleanup, and enhancement with effects. Plus, it includes tools for audio generation by building loops and even automatic creation of customized scores. 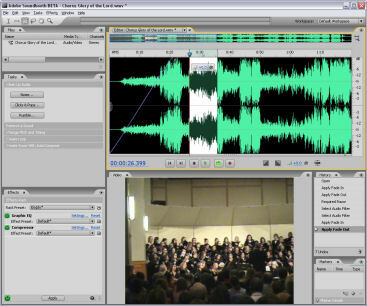 The basic Soundbooth editing interface uses the new Adobe style with a collection of interlocked panels that adjust as you drag to rearrange them, or can be moved out as separate floating windows. There's also the History panel to help you experiment and easily undo changes. You can open and save media files in a profusion of formats (as in Premiere Pro) -- both audio-only clips and video clips with audio (so you can see your edits in sync with the accompanying video). The integration with the Adobe suite allows you to edit clips in Soundbooth directly from Premiere, and then have changes updated automatically within the Premiere project. Similarly, you can import and export markers within the clip to use in other applications, including for setting animation points in Flash. You then edit files and view the waveform in the Editor panel. 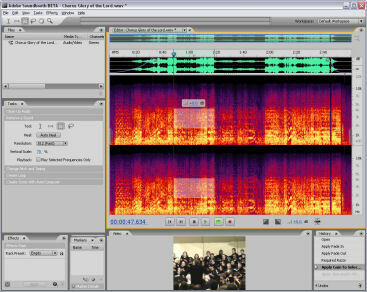 Soundbooth is focused on direct on-clip visual editing. Just drag to select the entire clip or a portion, and then cut and paste to extract portions, drag from the sides to trim, drag from the top edges to fade in/out, and drag to adjust the volume level. Once you have the basic clip prepared, move on to the Task pane to perform common (but sophisticated) tasks to clean up audio clips. The Clean Up Audio task has presets for cleaning background Noise, background Rumble, and transient Clicks and Pops. Each provides a few controls with sliders you can adjust while the audio selection is playing -- plus a bypass button to compare to the original. The Change Pitch and Timing task can independently adjust the length of the clip and the pitch of the sound -- you can stretch or shrink the length without affecting pitch, or to change the pitch of the sound without altering the length of the piece. The most amazing task, Remove a Sound, is based on Audition's Spectral Frequency view -- instead of seeing your audio as a simple waveform with all the sounds integrated into a single curve, Soundbooth displays the entire frequency spectrum, so you can see the frequency components. While sudden clicks and pops are obvious as spikes in a waveform display, the frequency view allows you to see individual components of the audio, including instruments, as well as other unwanted intrusions such as a cough or a ringing bell. Now here's the magic -- if you can see the sound, then you can select it -- and if you can select it, then you can edit and remove it. Soundbooth (and Audition) turn audio clean-up into the same kind of visual editing you are used to with Photoshop. First select the offending audio -- draw a rectangle, or even choose an arbitrary region with the lasso. Then tone down the sound by reducing its volume, or, even better, use Auto Heal to actually remove the selected noise, much like Photoshop's Healing Brush. It's real magic for rescuing clips that are marred with brief unwanted noises. Next, apply audio enhancement effects, with filters including EQ and compression to punch up the sound, a vocal enhancer, and effects such as delay, chorus, and reverb. You can assemble multiple effects in the Effects panel and hear the result playing in real time, even as you adjust the parameters. Beyond recording and editing clips, Soundbooth provides two interesting tools for generating new music. The Create Loop task lets you turn a selection into a seamless loop -- select and preview the segment, and then Soundbooth can apply smoothing to the loop point. These can be used for DVD menus, or in a mixing tool like Audition. Or use the Create Score With AutoComposer task to customize your own entire soundtrack, much like Sonic Soundfire. Open one of the pre-built soundtracks, and adjust the duration to fit your clip -- the overall piece is adjusted to fit, as the intro, main piece, and ending are rearranged to maintain a coherent score. Then customize the sound, changing the volume, intensity, and melody. Or fine-tune even more, using keyframes to control these attributes to better match the flow in your video. Adobe plans to offer a library of these AutoComposer scores, plus open up score creation for others as well. This entry posted on March 9, 2007. Previous: Blue-Laser Blues: Getting HD video to disc. Next: Mobile Internet: Verizon EV-DO.